“It seems crazy that it takes a 4,000 pound vehicle to carry a 70 pound boat,” I said as my wife helped me load Terrapin on the roof of our car for the two mile ride down to the river. Every time I took the boat out after that, this simple thought ate away at me. I had to find a way to get my Adirondack guideboat to my favorite put-in spot without using a car. It was too time consuming to walk it down there and back, but since it is downhill virtually the whole way, wheels made a lot of sense. The idea started out innocently enough, but it was soon consuming. For years I hauled my kids around in a bicycle trailer and no one ever got hurt, nor did we wipe out. Given my good track record, I felt I could haul a valuable and lightweight boat that wasn’t as heavy and didn’t squirm as much as two active boys. An internet search revealed a multitude of carts made for wheeling boats around by hand, but every bicycle-based design looked flimsy and featured a tiny kayak or canoe tethered to a bike that appeared as if it had never been more than a few feet from the garage. I was disappointed, but refused to give up the idea. One day I stumbled on a blog post about a young Portlander who made trailers and functional objects out of old bicycle parts. It took me a few days to track Johnnie down, but when I did, I got a very positive reception. Although he had never built a boat trailer before, Johnnie felt it would make a good addition to his emerging product line-up and I was excited to have something sturdy enough to meet my needs. Johnnie was almost reluctant to have such a beautiful thing in the corner of the dusty, cold welding shop he rented. And I was fearful to leave Terrapin there because I imagined a wayward spark would melt a hole her hull, or worse: given the rough neighborhood where his shop was located, the boat might just disappear one night. When delivery day dawned, it was pouring rain. I offered to drive the trailer home from the shop on the roof of my car, but Johnnie was too proud to allow a car to be involved and insisted on biking it several miles to my house. He showed up completely drenched but he was just as excited to deliver it as I was to receive it. The trailer was a bike Frankenstein. Consisting of five bicycle rims, a few stems, a pair of handlebars, and miscellaneous multi-colored frame parts welded into a ten foot trailer, what it lacked in slickness, it made up for in funkiness. The welding wasn’t perfect, but it appeared strong and functional. I developed a method of strapping the boat to the trailer that seemed stable enough to go on a test run through the neighborhood. Despite a gentle flex as I pedaled along, the trailer worked reasonably well. It held the boat firmly in place, rounded corners a little better than a semi truck with a trailer, and was manageable going up hills. Its only mechanical flaw was that it placed a bit too much weight on the back wheel of the bike, which would immediately knock the bike it on its side if I didn’t park carefully. It seemed a small price for to pay for my newfound freedom. What I didn’t count on was the response I would get from people as I went by. They stopped raking leaves from their yards, looked up from car washing, and generally smiled. And I smiled too, at first. I found that people would wave to me. Then I’d hear an occasional whoop of joy and encouragement. Cars would give me a respectfully wide berth or would pass with the passenger’s head hanging out the window staring at me. Occasionally, someone would ask to take my picture. Parents would point me out to small children. I had gone from a guy who wanted to get his boat down to the river to a one man, rolling freak show. 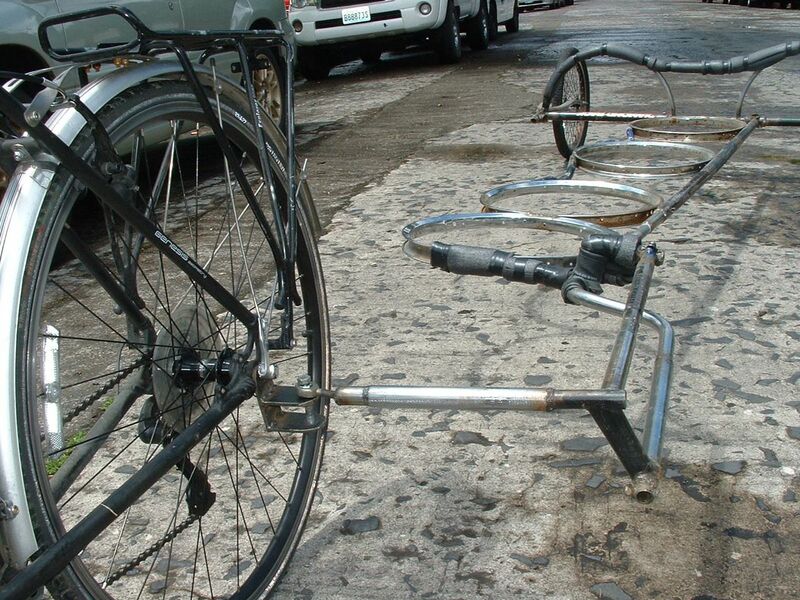 Portland is known as world-class bicycle city. Spend a few minutes on a busy bike route and in addition to standard lycra clad racers, you will soon see cargo bikes with a week’s worth of groceries loaded in a big box, a guy with purple hair riding a hand-welded “tall” bike some five feet off the ground, or a group of helmetless cyclists wearing old fashioned wool knickers. It didn’t fully dawn on me how odd I was until I was at a bike tour for Portland’s movers and shakers and was talking to a leading Portland bicycle advocate about my trailer. Her eyes got wide and a big smile came across her face. 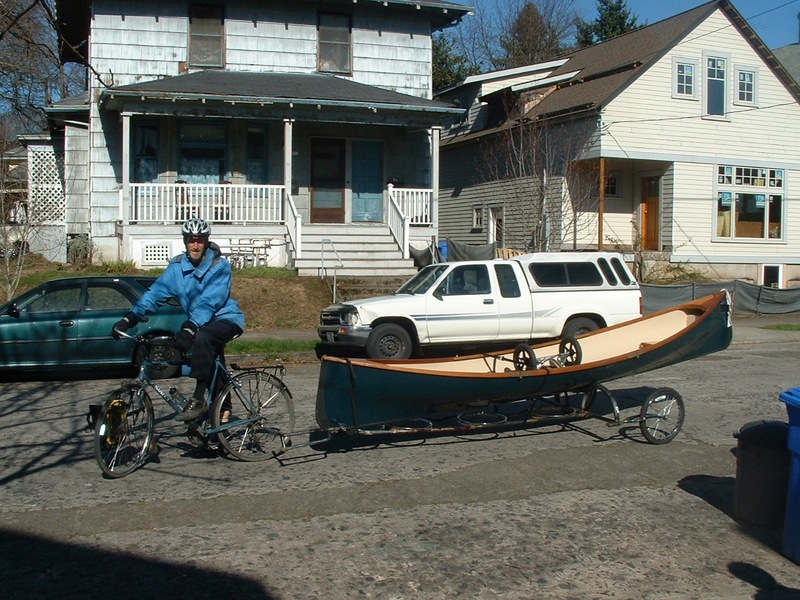 Never before had she heard of a Portlander hauling a boat by bike. She said I should be featured on the local bike news blog and scanned the crowd for the author. That was the final straw. In a town with commercial delivery bikes, a beer bike, and a coffee bike cart, I didn’t see why my boat trailer should appear so weird. On the one hand, I felt that when I biked my boat along, I was doing something practical, but on the other I felt I was drawing too much attention to myself, which was not at all my desire. 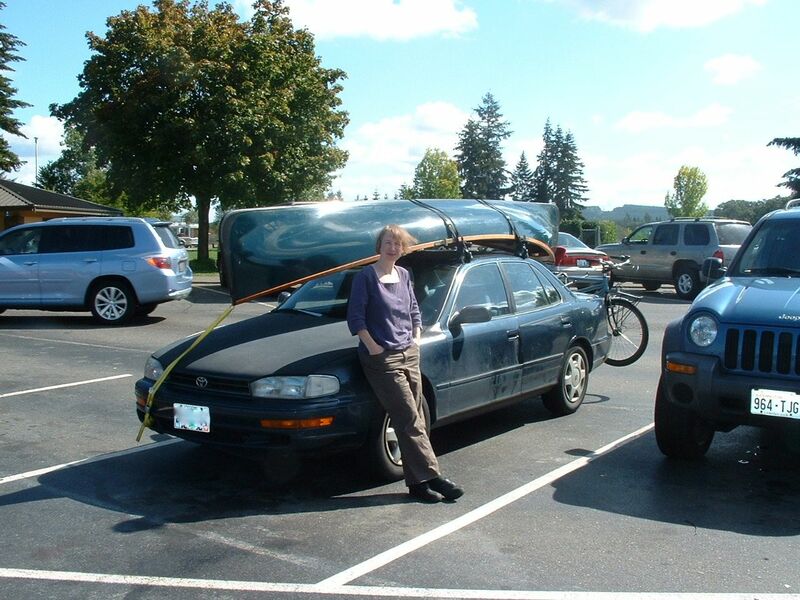 Couple that with the trailer’s imperfections, I began reverting to carrying my 70 pound boat with my 4,000 pound car. By cycling to the river, I may have been spreading joy and inspiration, but I was done. I found a new home for the trailer and now enjoy the anonymity of driving my boat to the launch ramp in peace. Your OG weirdness is an inspiration to me. Glad you found a home for the trailer. A captivating story, as always. But it’s the boat that takes my fancy. It seems most suitable for a romantic expedition. How did Jane Austen put it? A rugged man in possession of a fine boat must be in want of a lady to share it. Something like that, I do believe.